Everything you need to make your choice, in one place. Wireless speakers have become the quiet juggernaut of the audio industry. Ever since features like Bluetooth and WiFi became commonplace, manufacturers have been tinkering, slowly freeing us from the chaos of wires and ceiling speakers and making their products better and better. But wired speakers still dominate, with proponents saying that they offer audio quality that wireless ones will never be able to match. 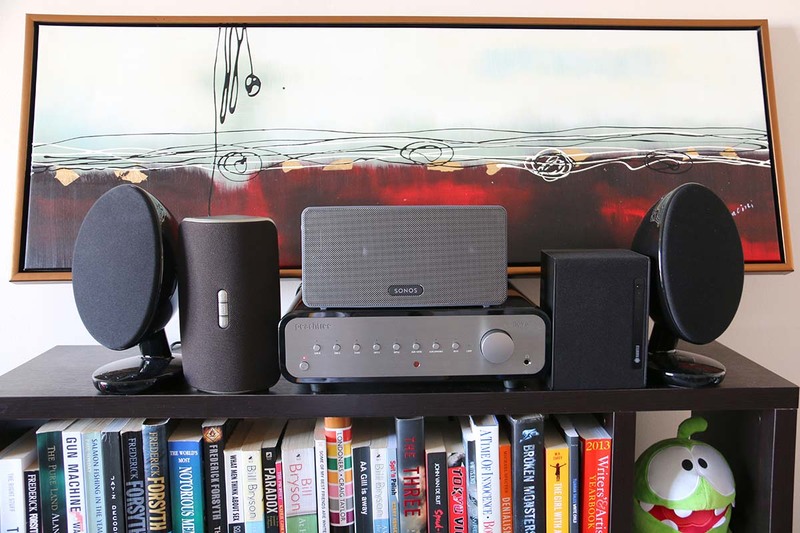 One of the most frequent questions we get asked is whether someone should buy wired speakers, or wireless, and we thought it was about time we talked about the pros and cons of each. Do Expensive Cables Make A Difference? The accepted knowledge, ever since wireless speakers first became available, was that wired speakers simply offered better sound quality. The reasoning for this was quite simple. It was much, much easier to transmit greater amounts of electrical data down a physical wire than it was to send it on a wireless signal. More data equals a higher fidelity, and so for a long time, wireless speakers just couldn’t cut it. Thus it was. Thus it was ever supposed to be. Well, that was a while ago. And while you could still make a pretty convincing argument that wired speakers deliver better audio fidelity, especially when extremely high-quality components are involved, you look a bit foolish if you denied that wireless systems weren't starting to sound pretty incredible themselves. The gap is a lot narrower than it used to be. The difference between a high quality wireless signal and that transmitted over a wire is starting to get to the point where you have to work quite hard to find the difference. Oh, we’ve no doubt but that last sentence has enraged the hard-core audiophile crowd, but for most of us, it’s true. A couple of things have made this possible. Firstly, we are now able to transmit sound over WiFi, which means that we can handle a lot of data, which will improve the quality of the sound. Secondly, Bluetooth standards have been creeping higher and higher – the latest protocols, like Bluetooth 4.1, can handle a truly staggering amount of data, all of which results in more depth and detail to the sound. Thirdly, speaker design has improved, and continues to do so. Enhanced driver technology, better power management and the like allow wireless speaker makers to more than match their wired counterparts. None of which actually answers the question you are probably desperate to know the answer to: which is better? Wireless, or wired? Unfortunately, the answer isn’t that simple. There are many, many things to take into account – from room acoustics to additional components to the type of material to the quality of the cables. Don’t worry: by the end of this guide, you’ll have more than enough information to make a decision, but we just need to say from the outset that it’s not going to be as cut and dried as you’ probably like. Sorry! However, just because it’s not simple doesn’t mean we can’t test this kind of thing, using closely matched speakers. This won’t answer the question in its entirety, but it will take us some of the way there. Conducting a side-by-side, blind test can be tricky – not because it’s impossible to set up multiple speakers, but because there are so many differences between wired and wireless speakers, in terms of construction. But while we were putting together this guide, it occurred to us that we should backup our arguments with a little bit of a test. So although we don’t delve deep into scientific measurements on this site (as valuable as they are, we don’t think you need that much detail to buy a speaker or a pair of headphones), we did put together a relatively scientific test, using products from a company named Audioengine, who make both wired and wireless speakers. For our test, we lined up their HDP6 wired bookshelf speakers, against their HD6 wireless speakers. It’s a little hard to compare them in absolutely scientific conditions, because obviously we have to select an amplifier for the wired speakers that will differ from the wireless (we used an old Yamaha receiver, the HTR-2067, which doubles just fine as a stereo amp, and has a sound we are intimately familiar with). But we controlled what we could, relying on the same sound source, positioning them in the same place in our testing room, and playing identical tracks. We also did a blind test, getting the friend who leant us their HD6s to play the material. In addition, the speakers have very similar construction - both are roughly the same size, are constructed from the same material, and both have 5.5" Kevlar woofers and 1" silk dome tweeters. They also have an identical frequency response. While there were subtle differences in the sound, we were very hard-pressed to name either set of speakers ‘better’ or ‘worse’, and we couldn’t tell which was which in our blind test. One speaker set - later revealed to be the HD6 wireless pair - had a little bit more low-end presence, while the passive bookshelf speakers delivered a touch more detail. In both cases, the sound was perfectly acceptable. We’d have to do extensive testing with other sets of speakers to be sure, but we’re pretty confident that wireless audio, at the very least, has the potential to be the equal of wired. The biggest advantage of wired speakers actually has nothing to do with sound quality, whatever audiophiles may say. No, the biggest advantage is about control. Put simply, wired speakers offer you a level of control over the finer aspects of the sound than wireless speakers do. Every digital sound system - by which we mean one where the source is digital file, streaming audio or a CD, rather than, say, vinyl records – needs two things between the source and the output device. It needs a digital-to-analogue converter (DAC), to convert digital 1s and 0s into an analogue signal that we can actually hear, and it needs an amplifier, to boost that analogue signal to acceptable levels. This sounds tricky, but it really isn’t: even your phone has a DAC and amp inside it, which is why you’re able to plug a pair of headphones in and start listening immediately. These two components have a huge impact on the sound you will eventually hear, and in a set of wireless speakers, you don’t get any control over them at all. They are housed within the speaker itself – they have to be. But with a set of wired speakers, that’s not the case at all. With a set of wired speakers, you have full control over these. While it does mean, of course, that you will need to buy a separate amp and DAC (although there are plenty of solutions that contain both in a single box), you also get to control the ones you buy. You may decide to go for a tube amp, to fatten up the bass on your soul and hip-hop collection, or you might opt for a solid-state amp if you want clean, digital clarity to make sure that the guitars in your rock tracks bite hard. You get to choose. With wireless speakers, that choice has been made for you. The other advantage is that wired speakers are very easy-to-use. All you need to do is connect them to an amplifier with a length of speaker wire, which a moderately intelligent chimp could probably figure out how to do. That doesn't mean they don't have downsides. Chief among these is that you will have to deal with wires – obviously. For some, a collection of snaking cables can be a real annoyance, an annoyance which can be multiplied if you happen to be setting up are full surround sound system. We’ll talk about the difference that expensive cables can make below. The second major downside is that you will need to do a little bit of calculation when making your purchase, to ensure that the speakers are correctly matched to the power level of your amplifier. You don’t need to stress too much about this – you have to work quite hard to blow your speakers – but it is something that you need to do. Fortunately, we have a comprehensive guide to doing just this, and you’ll be surprised at how straightforward it is. Again, we’re going to steer clear of the sound quality debate here. We are more interested in the advantages and disadvantages of wireless speakers, and when you’d actually spring for them. The chief advantage, you will be absolutely stunned to hear, is that there aren’t any wires. All you need to do is plug in your speaker, connecting it to a wall outlet (or not, if it’s battery driven), then hook it up to your sound source via WiFi or Bluetooth, and you’re away. For us, this is absolutely the best reason to own a wireless speaker. It is so unbelievably easy. The other advantage is that a wireless system can be incredibly versatile. You can have a single speaker, or multiple speakers dotted around the house, all talking to each other. You can, with clever software innovations like PlayFi, get speakers from different manufacturers talking to each other – something that is possible with wired speakers, where you could use two different sets of speakers on a single system, but not advised due to sound mismatching issues. So where does that leave you? When would you buy a wireless speaker? Well, you go for one (or several) if you want an easy, efficient sound system that will fit seamlessly into your existing gadget ecosystem, without any hassle or additional equipment. They are ideal for multiple rooms, too, even in small homes. Like any audio product, different speakers have different values, as well as different prices. It’s worth going into a little more detail about how you should pick your speakers. You are, after all, going to be buying more than one of them, and so there are a few things you need to bear in mind. This advice, we think, is agnostic: whether you’re a wired junkie or flying-free-wireless, you’ll be able to make use of it. The first thing, very obviously, is sound quality. Like any audio product, there will be differences between models. A speaker’s sound quality comes from a variety of factors, including the number of drivers it has, how big they are, how well they were made, the housing they are contained in and a zillion other things. Ultimately, all this costs money, and it will be up to you to figure out how much you’re willing to spend for good sound quality. Check our in-depth speaker reviews here, or our roundup of the best wireless speakers, or our take on the best bookshelf speakers here. The second is loudness. Essentially: how loud can a speaker go? No, the answer isn’t “As loud as humanly possible.” If you have a small apartment, there is absolutely no point shelling out thousands of dollars for an enormous set of speakers, because you aren’t going to be able to push them to their maximum volume without getting evicted. Loudness is expressed in sound pressure level, or SPL, a measure of how many decibels are pumped out at a given volume (it’s also, confusingly, often referred to as sensitivity. For example: the Paradigm PW-600 wireless speaker (full review) has a sensitivity of 91dB, while the SVS Prime Elevation wired speakers (full review) each have a sensitivity of 87dB. Sensitivity can be tricky, as not all manufacturers have the exact same testing standards, but they will give you a rough idea. In this case, the PW-600 is likely to be a little louder than the Primes, assuming the volume is the same. Then, you need to think about the number of speakers you’re actually going to buy. For wired speakers, this is pretty straightforward. At a minimum, you will need two - one per channel (don’t worry - they usually come in pairs). If you’re equipping a home theater system, which we’ll talk about in a little more detail below, then you may need up to five. For wireless speakers, this isn’t just as simple as going, “I have five rooms in my house and so I need five speakers.” How big are the rooms? What’s in them? Where are you actually going to put the speakers? Is your house open plan? Could two rooms conceivably be serviced by a single speaker? How often would you be in a situation where you’re listening to music in that particular room? Would it be better to skip that room entirely, and just put two speakers in the room you’re in most often? It’s a tricky one, and there’s no easy answer, mostly because you haven’t invited us inside your house yet to make an assessment (we take our coffee black, thanks). A good guide would be to think about how much time you spend in each room, and wherein the room you spend it. Take the kitchen. For most of us, your writer included, the kitchen in our home is quite small. We probably only need one speaker to do the job. On the other hand, if you have a large kitchen, or into cooking, and on moving around a lot doing very noisy things with casserole pots and blenders, then two speakers may be required. Ditto if you like having lots and lots of people over. A crowded living room with loud conversations needs a couple of well-placed speakers. Whatever you do, don’t give up the WiFi password, or some idiot of a guest will decide they want to show you just how awesome Creedence Clearwater revival really is, man. There’s also ease of use. Admittedly, this is more advice for wireless speakers, but hey ho. One of the beautiful things about multiroom systems is that, as they become more and more efficient, so have the means of controlling them. It’s not just that they should be easy to operate on a daily basis. They should be easy to setup, too. You should be able to connect them to the WiFi in under a minute, and be playing music a few seconds later. A lot of systems used to rely on built-in screens and buttons, which could make things tricky, but it is now far more common to do all the connections via an app. This should, in theory, be a breeze. However: don’t assume it will be. It’s always worth double checking the setup method for any speaker system you buy, on the off chance that it’s a bit more annoying than you thought it would be. Then you need to think about what the speakers look like. We’re kind of divided about this here. Normally, a good-looking speaker is a nice perk, but we are far more interested in how they perform and how easy they are to use than their aesthetics. Most speakers can get away with looking utilitarian; nobody is going to mind a set of big floorstanding speakers on either side of your TV, mostly because that’s where they’re supposed to be. People look at them once, and then never think about them again. That’s not the case with multiroom audio. What you’re doing here is putting speakers in parts of the house where one would not normally expect to see a speaker. If you live by yourself and/or don’t give one hoot about what your place looks like, then you can skip this part, but if not you may want to pay attention. Color is a big one. Do you want your speaker to stand out, or blend into the background? You could quite conceivably get a bunch of speakers that match the colors of your house, with very little effort. You also need to think about shape. To some extent, you can’t really control this, as most speakers are going to be small boxes of one configurations or another. But think about where you’re going to put them. Do they echo the surroundings, or jar with them? Again, you may not be too interested in this part, but it’s still worth mentioning. This is a pretty big one. So big, that we’re actually preparing a full, in-depth guide to getting it right. That being said: we can offer some (very general) principles in the meantime. If you want a more in-depth look, we recommend the one put together by the folks at SVS, who make some outstanding speakers. For two-channel, wired speaker hifi systems: Put a little bit of space (about a foot) between the speakers and the wall. Try to put the biggest drivers roughly level with your ears - although don’t stress if that’s not possible, as it doesn’t need to be exact. Don’t put anything in between the speakers and you. You should not, in theory, have to ‘toe in’ the speakers - angle them to face your listening position - they can face straight out. Nevertheless, spend a little bit of time playing music you’re familiar with, with the speakers in different positions, to get the sound you’re comfortable with. For wireless speakers: Generally speaking, the same rules apply as above. Distance from the wall, not having to toe in, that kind of thing. But the advantage here is that moving wireless speakers around is effortless. You should be able to find a spot that gives the best sound with no more than ten or twenty minutes of listening from different positions. For home heater setups: This is where things get complicated. When you have five, seven, nine or eleven speakers (plus a subwoofer) positioning is tricky. Let’s start with the easy bits: the front floorstanding speakers. These go, as your probably shocked to hear, on the floor, usually on either side of the TV. The exact placement of these is largely dependent on the shape of your room, but you want them in a rough triangle with the place you’re going to be sitting. They should be roughly equidistant, and shouldn’t be too close to walls or corners, which can lead to their bass frequencies getting a little muddled. Next up, the subwoofer. The received wisdom is to put the thing underneath or next to the TV, but there’s actually a little trick you can use to find the best place to put it. Wire up the subwoofer (and we’ll talk about wiring in the section below) then put it in the place where you’ll be sitting. Find something bass heavy. A track by Skrillex or Diplo would be ideal. Start playing, then crawl around the room at floor level. Yes, we know you look ridiculous, but there is a purpose to this, we promise. Find a spot in the room where the bass sounds the best, where it sounds as it’s meant to. That’s where you want to put your sub. This trick isn’t completely full proof, and again, largely depends on the size of your room, but it’s still very useful tool to have in your arsenal. Now: the surround speakers. The easiest one of these to place is the center speaker, which should be labelled as such. Put it in front of or just underneath your TV. Job done. Next, check out the front left and right speakers, which, again, should be labelled clearly. These are quite tricky to place. You need them at ear level when you’re sitting in your listening position, and you also don’t want them too far apart or too close together. Doing either of those things will mess with your sound. Start with the speakers around three feet from the TV on either side, and work from there. You’ll need to experiment a little bit to get it right. Assuming you’ve got a 7.1 system, you will have four more speakers to place. Two of them should go directly to the sides of your listening position, again at eye level. The biggest mistake we see is people mounting them in the ceiling or in the corners of the room. Don’t do that. Don’t be a corner-mounter. Get two on either side, and two at the rear. And by rear, we mean a good three or four feet behind your listening position. By now, you may be thinking: what if I have a small room? What is my listening position (usually the couch) is up against the wall? How do I place rear speakers then? Answer: you don’t. If you have a small room, a 7.1 system is going to be wasted. You’re far better off buying a 5.1 system, or better yet, ditching surround sound entirely and just going for a good pair of floorstanding speakers. It will save you time, money, and irritation. We know. We’ve been there. Maybe. We don't know. Please don’t kill us. No topic in audio is more fraught than this - and frankly, we’re not sure we’re ready to come down on one side or the other. Sorry. The factors that could make a difference with expensive cables largely come down to things like their complex resistance and electromagnetic shielding, and the result is likely to be subtle to invisible. We simply haven’t done enough A/B testing to call it for sure. Our take: if you’re spending a lot of money on your system, then there’s nothing wrong with spending a few extra bucks on cables. If you just want a set of basic speakers, or you’re on a budget, standard 16-gauge speaker wire will be just fine. Wireless home theater has come on in huge ways over the past few years. Leading the pack is axiim, who currently offer an excellent 5.1 system that made our list of the best home theater setups around. They also offer a 7.1 system, which we haven’t tried yet. The joy - no, the revelation - of having a 5.1 setup without any dangling speaker wire is just outstanding. It literally removes the biggest pain point of the entire thing. Once you’ve tried it, you won’t be able to go back. The downside: it’s expensive. And while it sounds excellent, we think that the fidelity of traditional wired systems just about beats it. It’s not bad - quite the opposite - but the quality isn’t quite as good. You’ll also need to connect each speaker to the mains. Still, it’s good to know that there are options. And if you care more about convenience than audio quality, you should check out wireless setups. If anything, this topic has more heated debates than the one about whether you should use wires or not. For a long time, we at TMS told everybody who asked to go for WiFi. Our logic was simple: wireless signals are able to transmit more data at higher speeds, and so result in better audio quality. To prove this, all we had to do was turn to our SONOS PLAY:3 (Full review), which far outperforms any Bluetooth speakers we’d tested. But times have changed. With the development of Bluetooth continuing, new technology like aptX, which reduces the bit rate on a Bluetooth signal without having a serious effect on the quality, has made a real difference in audio fidelity. That’s in addition to technology like Bluetooth 5, which was revealed last year and which features in the new Samsung Galaxy 8; it can deliver up to 2 MB a second at a greatly increased range. This is something that is going to continue to get better and better. So right now, there’s very little difference between the two. What should govern your choice is actually what you are already. If you have lots of Internet connected devices on your home network already, then you may want to steer clear of WiFi-only speakers, like that SONOS. If, however, you only have a few things connected to the Internet, then you should spoil yourself and get a WiFi-capable speaker to handle your audio. In our experience, this is more effective for true multiroom setups, too, where you have different speakers playing in different parts of your home. But what if you have are weak or crowded WiFi signal, but still want to stick with WiFi? In that case, it may be worth investing in something like the SONOS BRIDGE or the Raumfeld Expand, which will greatly increase the capacity of your network. However: don’t sweat it too much. Remember that blind test we did earlier? The HD6 wireless speakers we used rely on Bluetooth. The quality is good. Just trust us. In terms of simple, budget friendly speakers, we can’t think of one better. It’s not going to challenge big-name audiophile speakers, and it may not handle high resolution audio particularly well, but it sets up in minutes, and offers a phenomenal user experience. It’s a couple of years old now, but is still among the best systems available. By using the included microphone and room correction software, you can calibrate the speaker to your listening environment, resulting in some of the best wireless sound available. It’s also Play-Fi equipped, and although we’ve had significant problems with their app, the PW 600 works with other speakers just fine. An excellent third option from a very capable brand. The Minx Air 200 has both Bluetooth and Wi-Fi connectivity, as well as access to Apple AirPlay, Spotify and Internet radio. It has its own app, a couple of analogue inputs, and delivers crisp, powerful sound. You’d have to argue very hard to say that these guys don’t make some of the best speakers on the planet (and subwoofers that blow the walls apart). The Ultra bookshelf speakers topped our list of the best such models this year, and we don’t expect it to move any time soon. It’s got some serious power, looks fantastic, and delivers some of the best bang-for-buck around. If you want to make a start with a decent home system, try the Ultras. They rock. A little old now - but still phenomenal. And it’d be a shame to use these in a blind test, and not big up them here. The passive HDP6s - passive referring to their need for an external amplifier - are absolutely gorgeous, with a wonderful wood exterior. The sound is good, if not spectacular, but it’s right for the price (around $500 at the time of writing). If you want a wireless version, try the slightly pricier HD6s. Let’s finish things off with a pair of floorstanding speakers for your home theater. The 590s have a big, bruising sound that we love, and we think they’re fairly-priced, too. You may need to work a little to track them down - they’re not on Amazon, last we looked - but they’re worth the effort. And if you want to compare other floorstanders, try our list of the best currently available. We're working on a full video guide to wireless vs wired speakers. Meantime, here's our video on how to get started with wireless!